Not to be confused with Tempera. Tempura (天ぷら or 天麩羅, tenpura, [tẽ̞mpɯᵝɾa]) is a Japanese dish usually consisting of seafood or vegetables that have been battered and deep fried. The dish was influenced by fritter-cooking techniques introduced by Portuguese residing in Nagasaki in the 16th century, and the name "tempura" relates to that origin. A light batter is made of iced water (sometimes sparkling water is used to keep the batter light) and soft wheat flour (cake, pastry or all-purpose flour). Eggs (especially egg yolk), baking soda or baking powder, starch, oil, and/or spices may also be added. Tempura batter is traditionally mixed in small batches using chopsticks for only a few seconds, leaving lumps in the mixture that, along with the cold batter temperature, result in the unique fluffy and crisp tempura structure when cooked. The batter is often kept cold by adding ice, or by placing the bowl inside a larger bowl with ice in it. Overmixing the batter will result in activation of wheat gluten, which causes the flour mixture to become soft and dough-like when fried. Specially formulated tempura flour is available in worldwide supermarkets. This is generally light (low-gluten) flour, and occasionally contains leaveners such as baking powder. Tempura generally does not use breadcrumbs (panko) in the coating. Generally, fried foods which are coated with breadcrumbs are considered to be furai, Japanese-invented Western-style deep fried foods, such as tonkatsu or ebi furai (fried prawn). Thin slices or strips of vegetables or seafood are dipped in the batter, then briefly deep-fried in hot oil. Vegetable oil or canola oil are most common; however, tempura was traditionally cooked using sesame oil. Many specialty shops still use sesame oil or tea seed oil, and it is thought certain compounds in these oils help to produce light, crispier batter. The bits of batter (known as tenkasu) are scooped out between batches of tempura, so they do not burn and leave a bad flavor in the oil. A small mesh scoop (Ami jakushi) is used for this purpose. Tenkasu are often reserved as ingredients in other dishes or as a topping. Various seafood and vegetables are commonly used as the ingredients in traditional tempura. Tentsuyu is the most common sauce consumed with tempura. Cooked bits of tempura are either eaten with dipping sauce, salted without sauce, or used to assemble other dishes. Tempura is commonly served with grated daikon and eaten hot immediately after frying. In Japan, it is often found in bowls of soba or udon soup often in the form of a shrimp, shiso leaf, or fritter. The most common sauce is tentsuyu sauce (roughly three parts dashi, one part mirin, and one part shōyu). Alternatively, tempura may be sprinkled with sea salt before eating. Mixtures of powdered green tea and salt or yuzu and salt are also used. Kakiage is a type of tempura made with mixed vegetable strips, such as onion, carrot, and burdock, and sometimes including shrimp or squid, which are deep fried as small round fritters. Tempura is also used in combination with other foods. When served over soba (buckwheat noodles), it is called tempura soba or tensoba. Tempura is also served as a donburi dish where tempura shrimp and vegetables are served over steamed rice in a bowl (tendon) and on top of udon soup (tempura udon). Black bass ten-don in Lake Ashi, Japan. Earlier Japanese deep-fried food was either simply fried without breading or batter, or fried with rice flour. However, toward the end of the 16th century, a fritter-cooking technique using flour and eggs as a batter was acquired from Portuguese missionaries and merchants from the region of Alentejo, who resided in Nagasaki. It came about as a way to fulfill the fasting and abstinence rules for Catholics surrounding the quarterly ember days (Latin: Quatuor Tempora). Hence, the etymology of the word, tempura. 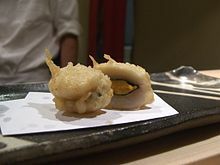 In those days, tempura in Nagasaki was deep-fried in lard with a batter consisting of flour, water, eggs, and salt, and unlike the modern version, was eaten without a dipping sauce. In the beginning of the 17th century around the Tokyo Bay area, the raw materials of tempura and its method underwent a remarkable change as the Yatai (food cart) culture gained more popularity. Making the best use of fresh seafood while preserving its delicate taste, tempura used only flour, eggs and water as ingredients and the batter was not flavored. 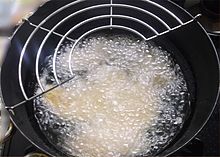 As the batter was mixed minimally in cold water, it avoided the dough-like stickiness caused by the activation of wheat gluten, resulting in the crispy texture which is now characteristic of tempura. It became customary to eat tempura by dipping quickly in a sauce mixed with grated daikon just before it was eaten. Today in Japan the mainstream of tempura recipes basically originate from "Tokyo style (Edo style)" tempura, which was invented at the food stalls along the riverside fish market in the Edo period. There are several factors for the popularization and flourishing of tempura at Tokyo Bay in the Edo period. The abundance of seafood in the Tokyo Bay is the basic factor. In addition, as oil extraction techniques advanced, cooking oil became inexpensive. In those days, serving deep-fried foods indoors was prohibited in Edo due to a possible fire hazard. Traditional Japanese housing was constructed with paper and wood which could catch fire easily from the tempura oil. For that reason, tempura gained popularity as fast food eaten outside at the food stall. Eating tempura in those days was made to be convenient like fast food as tempura was skewered and eaten with a dipping sauce. Tempura has been considered as one of "the Edo Delicacies" along with soba (buckwheat noodles) and sushi which were also food stall take outs. The modern tempura recipe was first published in 1671 in the cook book called "料理献立抄". After the Meiji period, tempura was no longer considered as a fast food item but instead developed as a high-class cuisine. Look up tempura in Wiktionary, the free dictionary. 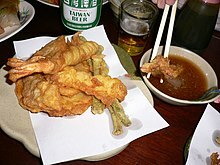 The word "tempura", or the technique of dipping fish and vegetables into a batter and frying them, comes from the word "tempora", a Latin word meaning "times", "time period" used by both Spanish and Portuguese missionaries to refer to the Lenten period or Ember Days (ad tempora quadragesima), Fridays, and other Christian holy days. Ember Days or quattuor tempora refer to holy days when Catholics avoid red meat and instead eat fish or vegetables. The idea that the word "tempura" may have been derived from the Portuguese noun tempero, meaning a condiment or seasoning of any kind, or from the verb temperar, meaning "to season" is also possible as the Japanese language could easily have assumed the word "tempero" as is, without changing any vowels as the Portuguese pronunciation in this case is similar to the Japanese. There is still today a dish in Portugal very similar to tempura called peixinhos da horta, "garden fishes", which consists in green beans dipped in a batter and fried. The term "tempura" is thought to have gained popularity in southern Japan; it became widely used to refer to any sort of food prepared using hot oil, including some already existing Japanese foods. Today, the word "tempura" is also commonly used to refer to satsuma age, a fried fish cake which is made without batter. In Japan, restaurants specializing in tempura are called tenpura-ya. Many restaurants offer tempura as part of a set meal or a bento (lunch box), and it is also a popular ingredient in take-out or convenience store bento boxes. The ingredients and styles of cooking and serving tempura vary greatly through the country, with importance being placed on using fresh, seasonal ingredients. Outside Japan (as well as recently in Japan), there are many nontraditional and fusion uses of tempura. Chefs over the world include tempura dishes on their menus, and a wide variety of different batters and ingredients are used, including the nontraditional broccoli, zucchini, asparagus and chuchu. More unusual ingredients may include nori slices, dry fruit such as banana, and ice cream (tempura-based fried ice cream). American restaurants are known to serve tempura in the form of various meats, particularly chicken, and cheeses, usually mozzarella. A variation is to use panko (breadcrumbs), which results in a crisper consistency than tempura batter. Using panko in Japan would no longer qualify the dish as tempura. It would become something else called fry or pronounced in Japanese as furai. Tempura (particularly shrimp) is often used as a filling in makizushi. A more recent variation of tempura sushi has entire pieces of sushi being dipped in batter and tempura-fried. In Bangladesh the blossoms of pumpkins or marrows are often deep fried with a gram of rice flour spice mix creating a Bengali style tempura known as kumro ful bhaja. In Taiwan, tempura as described in the preceding is known as tiānfùluó (天婦羅) and can commonly be found on the menu in Japanese restaurants all over the island. A similar-sounding dish, tiánbúlà (甜不辣) (lit. sweet, not spicy) is usually sold at night markets; it bears no resemblance whatsoever with tempura, but can be considered a counterpart to Japanese oden. 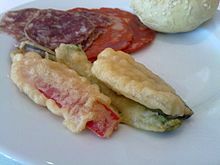 Wikimedia Commons has media related to Tempura. ^ Okamoto, Osamu (1994). Sam Okamoto's incredible vegetables. Pelican Publishing Company. p. 31. ISBN 1-56554-025-5. ^ Meyer, Arthur L.; Vann, Jon M. (2003). The Appetizer Atlas: A World of Small Bites. John Wiley and Sons. p. 235. ISBN 0-471-41102-7. ^ Kobayashi, Katsuyo (2000). The quick and easy Japanese cookbook: great recipes from Japan's favorite TV cooking show host. Kodansha International. p. 23. ISBN 4-7700-2504-1. ^ Frank, Dr Sandra (2017-01-07). "Dietitians Online Blog: January 7, National Tempura Day – Tempura Tofu and Spring Vegetables". Dietitians Online Blog. Retrieved 2017-01-25. ^ "Tempura Soba". Authentic Recipe List. Asian Inspiretion. Retrieved 6 November 2015. ^ Narloch, Leandro (2013). "Samurais". Guia Politicamente Incorreto da História do Mundo (in Portuguese) (1 ed.). São Paulo: Editora Leya. p. 163. ISBN 9788580448405. ^ "Japanese Writers' House Newsletter". 2007-10-10. Retrieved 2008-01-11.